Cracks in the pro-Trump media? To really understand the Trump presidency, you have to understand the pro-Trump media world. Fox News host Sean Hannity is one of the world's "leaders." He is now in the news for his unusually close ties to President Trump -- even relying on the same man, Michael Cohen, for legal counsel. Hannity portrays himself as the only media personality telling the truth about Trump's accomplishments. But Hannity's nightly show is just one part of this sprawling world. It also includes dozens of radio hosts, scores of web sites, and big companies like American Media, the owner of The National Enquirer. It even includes extremists like Alex Jones, the Infowars host who espouses conspiracy theories. Taken together, these are Trump's shelters from the storm. 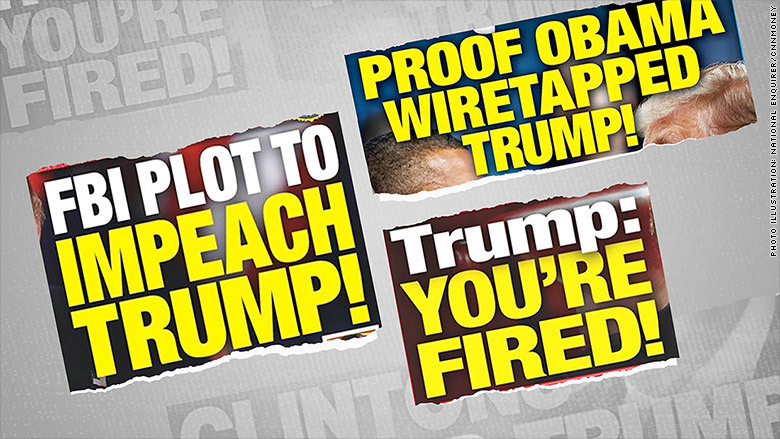 Shows like "Fox & Friends" and websites like Breitbart defend and protect the president in a variety of ways while simultaneously attacking other media outlets. They provide an alternative universe of information to Trump's base, sometimes even defending flagrant falsehoods about voter fraud and other topics. Some of the names you probably know: Newsmax. The Drudge Report. The Daily Caller. Some you might not: The Gateway Pundit. Lifezette. Campus Reform. Many of the sites post similar stories and promote each other, reinforcing a kind of echo chamber. Case in point: On the radio on Tuesday, Rush Limbaugh strongly defended Hannity, leading Hannity to tweet out praise for Limbaugh. The left has its own media outlets and echo chambers -- but numerous researchers have argued that this phenomenon is much stronger on the right. Entrepreneurs have tried to tap into this market for pro-Trump news alternatives. There's an entire website called Trump.News that aggregates stories from other sites. Pro-Trump social media users like Diamond & Silk have become widely recognized personalities by cheering him on. The National Enquirer is another important player. The tabloid, whose owner David Pecker is a longtime Trump friend, reportedly orchestrated hush money payments to bury unflattering stories about Trump. The Enquirer admits that it pays for stories, but denies doing so as a favor to Trump. What's clear is that The Enquirer thinks it's smart business to appeal to Trump's supporters. The tabloid runs story after story promoting Trump and denigrating his opponents. To be clear, Trump's boosters sometimes break with him, criticizing everything from his policy choices to his Twitter behavior. 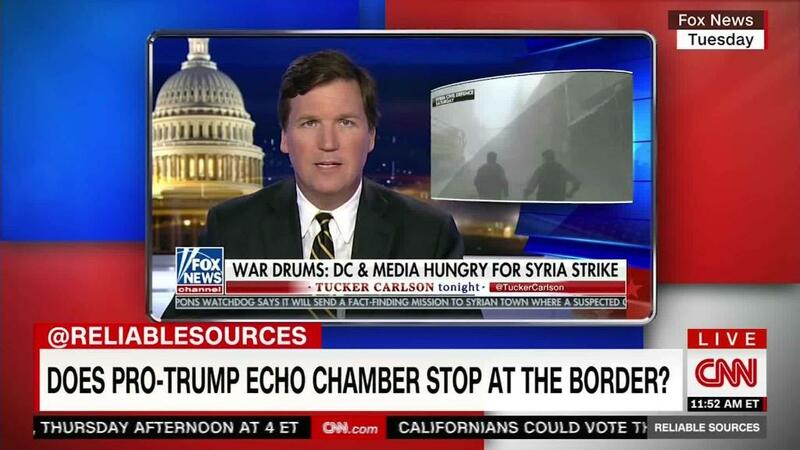 Many prominent pro-Trump commentators and social media stars were deeply skeptical of last week's strikes in Syria, for example. These disagreements oftentimes cause schisms within the pro-Trump media world. But no one really forgets what's at stake. Common enemies like Hillary Clinton and Robert Mueller unite the commentators and outlets. On the days when there's bad news about the White House, the president can, and does, refer people to this alternative media universe. He takes shelter from these outlets while condemning so-called "fake news." "The ability of Hannity and the rest of pro-Trump media to build on a counter-narrative to anything that's bad for Trump is invaluable for the president, both because it gives the GOP rank-and-file something to pay attention to that isn't Robert Mueller and because it helps muddy the waters around the Russia investigation," said Will Sommer, who studies the world of conservative media for his weekly newsletter, Right Richter. "Counter-narratives like the one Hannity has helped build around the Russia investigation -- in part by acting like the real crime is the leaking, or the surveillance, or Fusion GPS, or Uranium One-- also gives Trump loyalists a reason to avoid focusing their scrutiny on Trump himself," he asserted. Different commentators and companies play different roles. Fox News's Tucker Carlson, for instance, is more "anti-anti-Trump" than "pro-Trump." His colleague Pete Hegseth is more explicitly boosterish of the president, and was mentioned as a candidate for the Veterans Affairs secretary job. Of course, there has been a vibrant, profitable conservative media marketplace for decades -- with radio shows, books, magazines, and conferences all promoting conservative ideas and feeding off one another. "One of the more striking features of the contemporary conservative movement is the extent to which it has been moving toward epistemic closure. 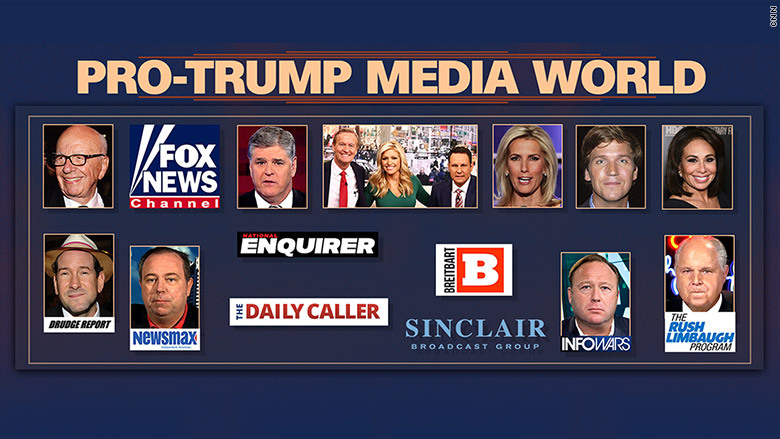 Reality is defined by a multimedia array of interconnected and cross promoting conservative blogs, radio programs, magazines, and of course, Fox News. Whatever conflicts with that reality can be dismissed out of hand because it comes from the liberal media, and is therefore ipso facto not to be trusted." The difference now is that much of this content is personality-driven, based around promoting President Trump more than the Republican party or conservative principles. "As long as Trump has the right enemies, he can depend on the conservative media to back him up," Bruce Bartlett said on Sunday's "Reliable Sources." Bartlett, a former Reagan administration official, has become known for his sharp criticism of Fox and other segments of conservative media. He said on "Reliable Sources" that "anti-anti-Trump" commentators and websites "hate the people who hate Trump more than they like Trump." Thus, they have the president's back when times are tough. Critics say the pro-Trump media's business model depends on reinforcement of the audience's ingrained point of view. And they have predicted that Trump will lean heavily on this alternative universe if times get even tougher. "If he were to fire Deputy Attorney General Rod J. Rosenstein or even special counsel Robert S. Mueller III," the pro-Trump media "would give cover, and huge swaths of Americans would be encouraged to believe that the action was not only justified but absolutely necessary," Washington Post media columnist Margaret Sullivan wrote earlier this week. Hannity has led the charge against Mueller and Rosenstein. Sommer said Hannity matters to Trump more than most "because he's willing to put his credibility on the line defending Trump when bad news happens -- and thus provide a narrative that the rest of the right-wing media can follow." "Immediately after negative story comes out, Fox and sites like Breitbart tend to ignore it initially," Sommer said. "But by his prime time show, Hannity usually has a counter-narrative that blames the 'real' villains: the media, or Hillary Clinton, or the deep state. With that line set, the rest of the right-wing media can follow Hannity's line."